Whether you’re planning a full kitchen makeover, installing a new granite worktop or just want some quick ideas to make your home feel a bit brighter while the weather outside is still grey, we’ve got great suggestions for you. It isn’t everyone’s cup of tea, but yellow does make a room feel sunnier as it gives any daylight that summery tint. If you don’t fancy painting a wall or two, consider adding yellow hints or accents. As an example, painting the window surrounds yellow will help the room feel sunnier but you can also have a similar effect by adding yellow curtains or even something more subtle, such as a picture of sunflowers or yellow tea towels. We’re used to decorating for big holidays like Christmas but most of us don’t change anything much as our home moves from winter frosts to summer heatwave and back again. If you’re longing for summer to arrive, not just the sunshine, then celebrate the changing seasons by switching out winter items for summer. It could be as simple as moving your hot chocolate mug to the back of the cupboard and bringing lemonade glasses forward, but for the full effect change some of your decorations. If you have kids, why not get them to paint a picture to go with the new look? You don’t have to paint if you don’t want to! While changing a major feature, like a wall colour or adding a granite worktop will have a big impact you can change your colour scheme by changing the accent colours. Many kitchens are fairly neutral with white goods that live up to their name, wooden cabinets and a grey granite worktop. In these spaces, bright tea towels, picture frames, and even the magnets on the fridge are the main splash of colour. Add a bit of sunshine with zingy Mediterranean colours. 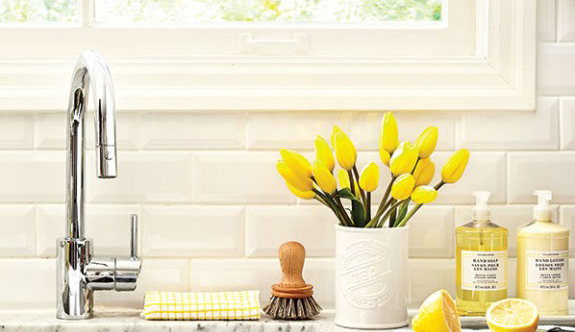 Cut flowers are a quick and easy way to bring a splash of sunshine yellow into your home. Daffodils are often grown in the UK so they’re readily available in spring and affordable. If you’d like something a bit longer lasting, buy a pot of bulbs or plant your own. Alternatively, plant bulbs outside your kitchen window and have spring flowers every year. From primrose curtains to a light granite worktop brighter colours will reflect more light and make your space seem brighter day and night. 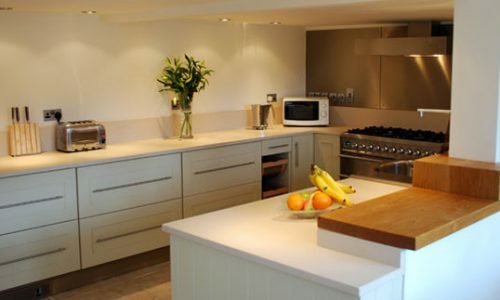 Your kitchen worktop is a main feature of your space so if you’re considering changing it, think hard about the options. Shiny stone will reflect more light than wood or other materials. While many people expect marble to be white and a granite worktop grey, the truth is that there are hundreds of shades of natural and engineered stone covering the full rainbow. Whatever spring means to you, whether it’s sky blue, daffodil yellow or fleecy lamb white, Surrey Marble and Granite have a stone to suit.